M.Sc. in Molecular Medicine is a postgraduate level program the duration of which is 2 years. Students seeking admission to this course must hold a Bachelor’s degree in relevant discipline or equivalent from a recognized university. Admission to this course will be granted based on candidate’s performance in the entrance examination followed by personal interview. The average fee to pursue M.Sc. in Molecular Medicine course ranges from INR 21,000 to INR 35,000. Students who are interested in getting expertise in the field of Molecular Medicine and want to become qualified researchers in this field are well suited to this course. M.Sc. in Molecular Medicine offers new scientific tools to focus on mechanistic aspects of different diseases, both in diagnosis and therapy. The career options in this course include employment in various organizations such as in Colleges and Universities, Research Laboratories, Hospitals, Govt. Organizations, Private healthcare organizations etc. After the completion of M.Sc. in Molecular Medicine program, students can get jobs of several profiles such as Teacher/ Lecturer, Researcher, Scientist, Technical Executive, Pharmacist etc. 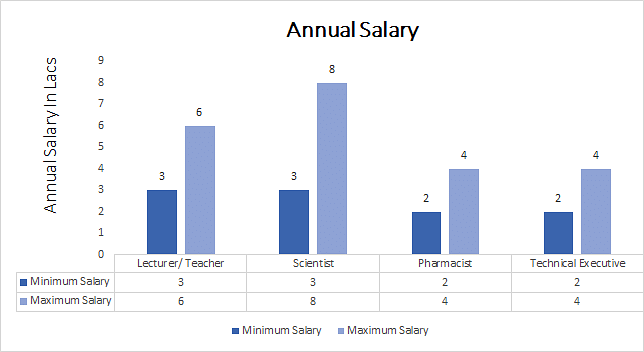 The average annual salary offered to Master’s degree holders in Molecular Medicine ranges from INR 3,00,000 to INR 8,00,000 and this salary depends on candidate’s experience and knowledge. Top Recruiting Organizations Subharti University (SDC), Pharmaceutical Companies, AIIMS, Narcotics Control Bureau etc. Top Recruiting Areas Colleges and Universities, Research Laboratories, Hospitals, Govt. Organizations, Private healthcare organizations etc. Top Job Profiles Teacher/ Lecturer, Researcher, Scientist, Technical Executive, Pharmacist etc. M.Sc. in Molecular Medicine: What is it about? M.Sc. in Molecular Medicine generally focuses on an interdisciplinary approach in which Medical Sciences, Molecular and Biological Aspects of Biology are addressed. This course is well suited to those students who want to do some kind of research in the field of Molecular Medicine and are interested in testing medicines and using drugs. Students seeking admission to M.Sc. in Molecular Medicine course should possess various skills such as Creative Mind, analytical skills and they must have a curious mind to excel in this field. On completion of M.Sc. in Molecular Medicine course, candidates can go for jobs in various fields such as in Colleges and Universities, Research Laboratories, Hospitals, Govt. Organizations, Private healthcare organizations etc. Candidates who wish to pursue M.Sc. in Molecular Medicine program must hold a Bachelor’s degree in relevant discipline or equivalent from a recognized university. In order to get admission to this course, students have to clear the cut off marks set by the College or University in the entrance examination followed by Personal Interview. Admission to M.Sc. in Molecular Medicine course will be granted strictly on the basis of candidate’s performance in the entrance examination conducted by the College or University followed by personal interview. Admission to this program will commence in the month of July. Students who wish to pursue this course can apply for the same either in the online more of in offline mode. To fill the application form online, students are required to visit the University’s/ College’s website and fill the application form with correct details. On successful registration, the admission authorities will contact you after which you need to visit the College/ University in person with all the documents required such as Graduation Mark Sheet, Degree, ID proof and Photographs. Students who wish to apply offline can purchase the application form from the college and submit the same after filling it correctly. On receiving applications from all students, the College/ University mentioned above will release their individual cut-off marks in the entrance examination for admission to this course. Admission will be offered only to those candidates who clear the cut-off marks and also on meeting the other necessary admission requirements. With the help of M.Sc. in Molecular Medicine course, students will be able to perform research activities in the field of Medicine and can develop their career as a Researcher. This course is best for those students who want to enhance their analytical and logical skills. After completing this program, several opportunities exist for students such as they could become a Lecturer/ Teacher, Researcher, Scientist, Technical Executive, Pharmacist etc. M.Sc. in Molecular Medicine is a popular course in the field of Science. The average salary offered to students after completing this course ranges from INR 25,000 to INR 65,000 per month and this salary depends on the college, degree and experience of the candidate. Students having sound experience in this field might get a job with good salary.